BCS (Bacon, Cheddar, Spuds) sammich. 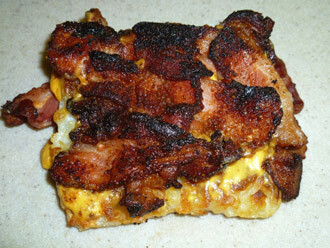 Step 1: Make bacon weave big enough to cover your potato patty. Thick bacon works best. 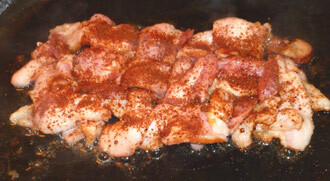 I covered my bacon in Mudflap Jones All-Purpose Rub. Step 2: Fry weave on both sides almost to your desired crispness. Add cheddar cheese to cover whole weave. Add previously fried in bacon grease potato hash brown to one end. 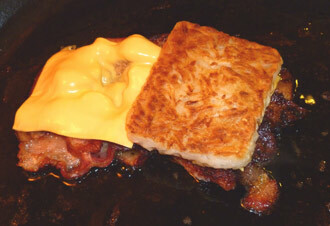 Flip other end of weave on top of hash brown patty. Step 3: Continue to fry bacon to desired crispness, flip and repeat for other side. Transfer when done to a paper towel to cool and to wick away excess grease if you must. Once cool enough to pick up with your hands, enjoy. Variations would be to add an egg or omelet on top of the potato, use fried potatoes with peppers/onion instead of hash brown patty or cheese of your choice. Experiment and happy eating.